Survival can be a strange business. Take, for example, the newly named Geckolepis megalepis, which, when trapped, simply sheds its big scales and scampers away naked. Researchers described the new species in the journal PeerJ. Scientists knew that all species of fish-scale geckos (genus Geckolepis) had big scales, and they all use this delightfully distinctive strategy. But what they didn’t know was how many species there actually are—because the same thing that helps the geckos escape predators is also what makes them very hard for scientists to catch. Early naturalists used to swaddle the geckos in handfuls of cotton wool to keep them from slithering out of their skins. Today, scientists set up plastic bags with bait inside and wait for the lizards to wander in. But even a bagged fish-scale gecko is tough to pin down, taxonomically speaking. Reptiles are often identified by the patterns of their scales. Fish-scale geckos shed and regrow their scales so often that any patterns they ever had are often disrupted by the time they’re fully grown. So scientists have started looking at what’s inside instead. A few years ago, a team of German biologists analyzed DNA from specimens of what were then thought to be all four Geckolepis species. As it turned out, four was a very low estimate. Genetic differences between specimens suggested that there could be as many as 13 different kinds of fish-scale geckos. The authors of the new paper decided to dig a little deeper. 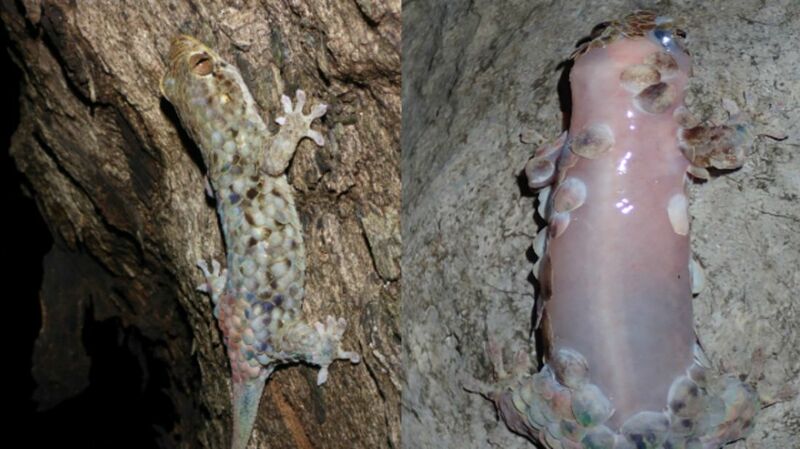 At first glance, the gecko certainly seemed like a separate species; even by Geckolepis standards, its scales were huge. To make sure, the researchers used micro-computed tomography (micro-CT) to create super high-resolution, 3D images of specimens’ skeletons. From this internal vantage point, it was clear that the mega-scaled gecko was definitely doing its own thing. Lead author Mark Scherz, a Ph.D student at the Ludwig Maximilian University of Munich and Zoologische Staatssammlung München, said in a statement, "What's really remarkable, though, is that these scales—which are really dense and may even be bony, and must be quite energetically costly to produce—and the skin beneath them tear away with such ease, and can be regenerated quickly and without a scar."